Rugged Alloy Products UN pressure vessels are designed and built to perform reliably for the world's most demanding users, in challenging transport situations around the globe. They live up to rigorous United Nations standards and Alloy Products' reputation for quality and long life. All APC vessels' pressure ratings and temperatures are designated in psi/bar and Fahrenheit/Centigrade. The UN certification test of reusable non-bulk packaging is so stringent, it is recognized worldwide as a performance standard (replacing D.O.T.5A certification). 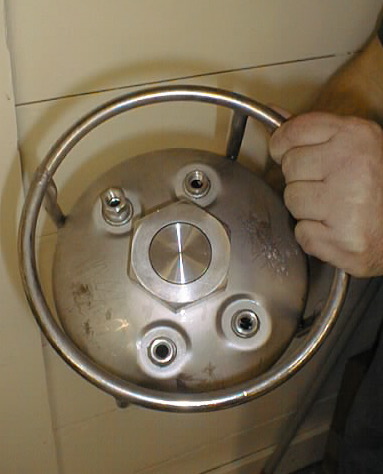 This pressure vessel comes with 5 fittings. 4 are 1/4 NPT, one with a siphon tube and the central fitting is a 1.5" ID flanged and 0-ringed closure for easy cleaning and filling. Protective Skirts & Chines: Added features provide sturdy, stable footing for your UN pressure vesses, and protect it against harsh environments and the rigors of frequent transport. * Impact-resistant rubber skirts are standard on 9"- diameter UN pressure vessels. * Ring chimes make it easier to transport vessels and protect fittings and other components during vessel shipment and use. Vessels are removed from service. The big hex fitting in the center of this photo is gasketed and removable. The 1/4 NPT siphon tube is shown in the 10 o'clock position.